This beautiful 4 bedroom villa includes two master ensuites, a private pool and games room. Located in a quiet community but only 15 minutes to Disney! This 4 bedroom villa is located within the prestigious community of Hampton Lakes. 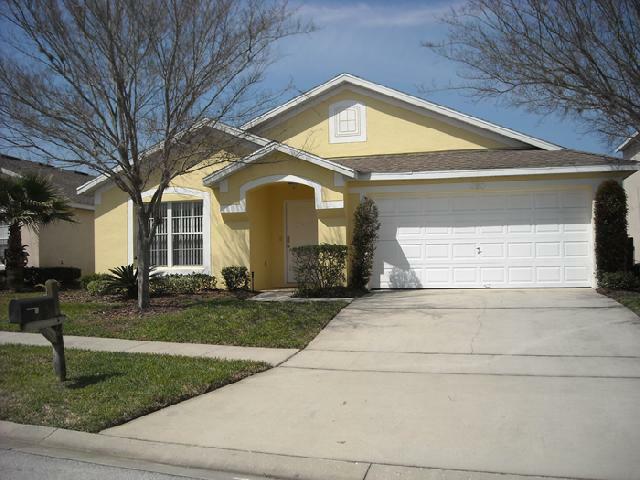 This quiet community is only minutes from the Disney Gates /Restaurants /Shops & Golf Courses. and close to all the Orlando Area Airports. The community boasts among other things a communal swimming pool with changing and toilet facilities, basketball, volleyball and floodlit tennis courts and a children's play area. HL4306 a great vacation home, ‘Your Home from Home’ awaits you and has the following for your comfort and enjoyment. There are 4 Bedrooms, 2 Master on Suite and 2 Twin and sleeps a total of 8 people. There are 3 Bathrooms. Wir haben eine sehr schöne Zeit mit 3 Personen in dem Haus verlebt. Wir waren kurz nach dem Sturm Irma in den USA und die Hausverwaltung hat uns in Deutschland angerufen, um uns mit Informationen bezüglich unserer Anreise Upzudaten. Es war alles in sehr gutem Zustand und empfehlenswert. Por dos años ustedes me han ayudado a conseguir la Casa para pasar mis vacaciones y las he disfrutado mucho. Villa was ideally located for us. Layout was good and no major issues with Villa. Excelente, Mayra tremenda persona, recomendaria el lugar, fue mucho mas de lo que esperaba,mi familia esta muy contenta, todos estuvimos super comodos. Vuelvo para el mismo lugar el año que viene. Mil gracias por todas las atenciones. Das Haus war hervorragend, sauber, toller Pool, bei der Ankunft ging die Klimaanlage nicht, was aber nach einem Anruf bei der Hausverwaltung, am nächsten Tag repariert war. Wir werden auch 2017 bei Floridabestvillas buchen. La experiencia de alquiler con ustedes fue excelente. Muy buen servicio y atención. Todo en general fue excelente. We had a great time. Great area.The only thing about the house is that the air conditioning was not that cool in the bedrooms. The rest of the house was good. Excelent service & accomodations. It was much more than expected. It was recommended by a coworker and Ive recommended it as well to all my friends. From now on I will never stay at a hotel again. This will always be my 1st choice. The house was awesome and we really enjoyed our trip!! The whole experience was worth every amount of money we spent!! Will definitely book through you again!! LA CASA NO SE ENCONTRABA A LA DISTANCIA QUE NOS INFORMARON EN CUANTO A TIEMPO; CONSTATAMOS QUE ERA BASTANTE MAYOR A LO QUE NOS DIJERON, SUMANDOLE A ELLO QUE LAS AUTOPISTAS SE CONGESTIONABAN Y LLEGARON A COLAPSAR EN VARIAS OPORTUNIDADES. USTEDES SON QUIENES CONOCEN LA SITUACION EN ESA EPOCA DEL AÑO Y EN LA ZONA Y OBLIGATORIAMENTE CONOCIAN LAS ENORMES DEMORAS PARA LLEGAR A PARQUES Y A CENTROS COMERCIALES QUE LLEGABAN A LAS CASI DOS HORAS. ESTO SIGNIFICABA NO SOLO TIEMPO SINO TAMBIEN DINERO EN COMBUSTIBLE O EN PEAJES PARA HALLAR OTRA RUTA ALTERNATIVA SIN CONOCER LA ZONA. OTRA CUESTION ES QUE DAVENPORT ES MUY DESOLADA. HAY POCA OFERTA TURISTICA COMO RESTAURANTS, BARES, SHOPPING CENTERS, ETC. EN LO QUE A LA CASA RESPECTA, SI BIEN CONTABA CON LOS AMBIENTES DETALLADOS EN LA OFERTA, NO RESPONDIA AL NIVEL ESPERADO, A SABER: CORTINAS ROTAS (DOS DEL LIVING PRINCIPAL Y LA DE LA PUERTA A LA PILETA). LA PUERTA A LA PILETA SE TRABABA CON UN PALO DE ESCOBA Y ERAN DE DIFICIL APERTURA. TODOS LOS CONTROLES REMOTOS SIN BATERIAS. EL DVD DEL TV PRINCIPAL NO FUNCIONABA. EL GARAGAGE PUBLICADO COMO PLAY ROOM ESTABA LITERALMENTE MUGRIENTO. LOS JUEGOS NO TENIAN MANTENIMIENTO. LA MESA DE PING PONG ESTABA PODRIDA Y GRUMOSA, TENIA DOS PALETAS CON LA GOMA DESPEGADA O ROTA. SOLO HABIA UNA PELOTITA. NOSOTROS COMPRAMOS Y DEJAMOS PARA LA CASA UN JUEGO DE 6 PELOTITAS. EL TEJO ERA DE MALA CALIDAD, EL COMPRESOR DE AIRE NO ELEVABA EL DISCO Y EL MARCADOR A VECES NO FUNCIONABA, LA MESA ESTABA SIN CONECTAR Y NOSOTROS TUVIMOS QUE BUSCAR LA FORMA DE HACERLO FUNCIONAR PUES TODOS LOS CABLES ESTABAN TIRADOS Y ENREDADOS, CON EL RIESGO QUE ESO CONLLEVA PARA EL USUARIO. LA CINTA ESTABA SIN FUNCIONAR!!!!! Y LA OFRECIAN PARA SU USO!!! ESTABA SEMICUBIERTA CON UNA LONA O ALGO ASI QUE DENOTABA QUE NO FUNCIONABA. TUVIMOS QUE COMPRAR LAMPARAS PARA LA CASA PORQUE LA ILUMINACION ERA MUY POBRE. TODOS LOS RESPALDOS DE LAS CAMAS ESTABAN SUELTOS Y GOLPEABAN A CADA MOVIMIENTO AL DORMIR. LOS DESAGUES FUERON LO PEOR DE LO PEOR, LOS BAÑOS SE TAPABAN CON UN SIMPLE USO, TODOS POR IGUAL; LO MISMO OCURRIA CON LA PILETA DE LA COCINA. AUN CUANDO FUNCIONABAN MAS O MENOS BIEN, SIEMPRE HABIA UN OLOR NAUSEABUNDO. ADEMAS EL BAÑO DE LA MASTER ROOM TENIA UN PORTATOALLAS DE ALUMINIO ROTO. SI BIEN NO ESTABA EN EL CONTRATO, LAMENTAMOS QUE NO HAYA EXISTIDO NI UNA SOLA ATENCIÓN EN CUANTO A ADORNOS DE NAVIDAD EN LA CASA, POR MINIMA QUE ESTA FUERA. ERAMOS LA UNICA CASA SIN LUMINARIAS DEL VECINDARIO. LA PUERTA DEL LAVAVAJILLA ESTABA DESENCUADRADA, FUERA DEL MARCO Y SE TRABABA AL QUERER CERRARLA. LA ASPIRADORA NO FUNCIONABA. LA CAPACIDAD DE LA HELADERA NO ESTABAN EN RELACION CON LA CANTIDAD DE PERSONAS QUE PUEDEN HABITAR LA CASA. TODAS LAS SILLAS ESTABAN DEMASIADO DESCOLADAS Y SE MOVIAN PELIGROSAMENTE. UNA DIRECTAMENTE TENIA EL RESPALDO QUEBRADO Y LA DEBIMOS SACAR DE USO. NO HABIA BOTIQUIN DE PRIMEROS AUXILIOS A MANO Y DEBIDAMENTE SEÑALADO!!! EL EXTINGUIDOR ESTABA MAL UBICADO ESTORBANDO LA CIRCULACIÓN. FUE MUY DESAGRADABLE LLEGAR EL PRIMER DIA Y ENCONTRAR EL HALL DE ENTRADA SIN LUZ, SUCIO Y CON UN AVISPERO. NOS OCUPAMOS DE CAMBIAR LA LAMPARA QUEMADA Y QUITAR EL PANAL DE AVISPAS. ENTRE LO BUENO CITAMOS LA ATENCION DE PROLONGARNOS EL HORARIO DE CHECK-OUT SIN CARGO, AUNQUE NO FUE AVISADO EL PERSONAL DE LIMPIEZA QUE INGRESO CUANDO AUN NOS HALLABAMOS OCUPANDO LA CASA. EL BARRIO ERA MUY LINDO, TRANQUILO Y SEGURO. EL ACCESO ILUMINADO ERA BELLISIMO. COMO SUGERENCIAS, ANOTAMOS EL PRONTO REEMPLAZO DE LUCES INCADESCENTES POR BAJO CONSUMO; PROVEER POR LO MENOS UNA PLAY STATION, UN BLUE RAY Y PELICULAS VARIADAS ACORDES CON EDADES E IDIOMA DE POTENCIALES VISITANTES; TAMBIEN LA INSTALACION DE CORTINAS DEL TIPO BLACK OUT PUES LAS ACTUALES NO TAPAN LA LUZ AL AMANECER Y NO SE PODIA SEGUIR DURMIENDO. La experiencia de rentar una casa de vacaciones con Floridabestvillas fue excelente. La casa fue muy cómoda, la cocina contaba con todos los utencilios que necesitamos, encontramos la casa y la piscina muy limpias. En futuros viajes volvería a rentar una casa con ustedes! Enjoyed our stay at the villa and will definitely book through floridabestvillas again in the future!